Peer Clear through your H-D Windshield! An innovative accessory available for Harley-Davidson motorcycle, removes rain, mist, and road spray from your windshield for enhanced visibility during inclement weather. 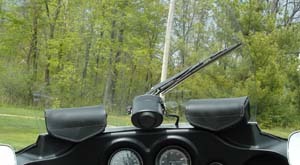 After six years of development from the OEM factory, eGlideGoodies is proud to offer the original motorized Motorcycle Windshield Wiper Systems designed specifically for your motorcycle. Planning your road trip is always a sure thing. Schedule your vacation days, pack up, pick your destination and hit the road. Unfortunately the weather is not such a sure thing and cannot be predicted. When your windshield becomes wet from rain, road and fog mist, add in streetlight and headlight glare, it is almost impossible to see and judge distance. These combinations make riding extremely difficult and hazardous forcing you to head for cover. Standing under trees and overpasses will be a thing of the past. Now with the touch of this unique Pad-Switch the motorized wiper will allow you to peer-clearly through your windshield like never before. PC-S: Standard kit includes heavy duty motor with automatic self-park feature, integrated on/off switch, and 5 year limited warranty. Reduces water drip on the back side of the windshield. Easy installation, drilling required. Drill bits not included. All 4 pieces of the wiper kit are packaged and sealed in individual sleeves, free of dirt/finger prints. PC-P: System includes a heavy-duty motor with automatic self-park feature, black powder coated lacquered aluminum cover, and limited 3-year warranty. 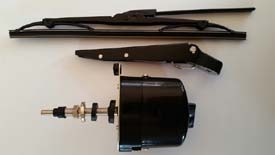 Adjustable wiper arm and blade with non-glare, black coating; 8 inches to 11 inches with 11-inch non-staining wiper blade. Motor shaft, motor face plate, and hardware in stainless steel. Premium Kit allows multiple switch configurations, so that your hands can remain on the grips of your motorcycle. Settable wiper sweep angle: 90 or 110 degrees. Park position can be set to either right or left side (factory set at 110 degree sweep, parks right side.) Reduces water drip on the backside of windshield. Easy installation kit included, drilling is required. Print the template to check for proper fit on your windshield. Not to be used for mounting! This is only to verify that the windshield is of proper height and that there are no obstructions when mounted. Follow template instructions to print, cut out and fold at specified marks to form a 3.25 inch wide, 3.25 inch deep, and 2.25 inch high box. This is the virtual motor housing. Note: Cut the template the full length of the paper. The margins, when printed on your computer, stop the lines from being printed. The template is the length of the standard printer paper. Measure down 10.75 inches from the center of the windshield and use tape to mark this position. Hold up the box so you can see through it. Place the top of the box to the 10.75 inch mark on the tape. Hold the box flush against the windshield, this will be angle of the motor once mounted. Note: It is important that you have the virtual motor box flush against the windshield. 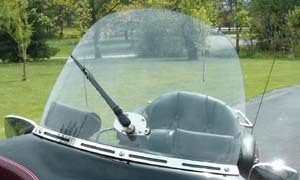 The angle of the motor when bolted to the windshield will follow the angle of the windshield. Verify that you have clearance and no obstructions with your dashboard and or gauges. Note: This is the minimum height required. The motor can be mounted as low as 13.75 inches from the top of your windshield to the top of the virtual motor box if the above clearances are met. The wiper system will work for you if the clearance is there. Does the wiper scratch the plastic windshield? After use of the wiper there maybe some fine hazing of the plastic, but with proper care and maintenance your windshield will perform for many years. Some of our customers have used the Wiper System on windshields for up to seven years. We recommend the use of the Windshield Polish sold on our website, as it removes fine scratches and any hazing. How difficult is the wiper installation? The whole installation of the wiper takes on average 1 hour. Everything needed to complete the install is included in the Premium kit. (Except the tools). Tools that you will need: Power Drill, Phillips screwdriver, small adjustable wrench. Does the wiper obstruct my view? All Premium Wiper systems are set for a 110 degree sweep with the wiper blade parking to the right side. All Standard Wiper systems are set for a 90 degree sweep with the wiper blade parking to the right side. "Touring has been more relaxing since I purchased the Wiper System. Riding in the rain is much easier now that I can see where I am going." "Where have you been all these years? Thanks for another very useful accessory for My Harley." 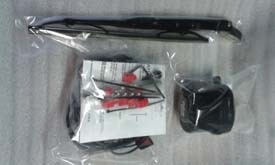 "The wiper system was so easy to install on my FLHTC. Your complete kit and instructions were awesome!" "Two years ago, I installed the wiper. Now I love my tall windshield! Still works great, on the same windshield that I installed it on." "I have finally got around to setting the wiper to park on the left, as you described. It worked perfectly. ...one of the best things I have bought for my motorcycle. Thank you very much. I have referred it to several of my friends." "Awesome addition to my motorcycle. I couldn't wait for it to rain to try it out. What an amazing change, being able to SEE in the rain. It should be mandatory. It has changed my whole outlook on riding in the rain."